If you know a child, aged between 10 - 12 years old, who would love to have his friends jump out their skins when they see him at Halloween, then this Childrens Scary Pumpkin Fancy Dress Costume would be perfect. 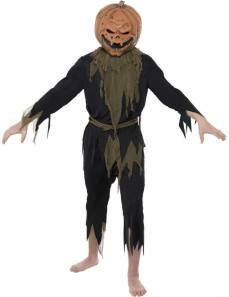 It is an ideal costume for any horror themed event or Halloween party and comprises of a long-sleeved black top with jagged edging and a brown overlay. Also included with the Halloween costume is a matching pair of trousers. This outfit costs just £10.99 online. The Pumpkin Head Mask is available separately should your child's face not be scary enough by itself. This evil looking orange coloured overhead pumpkin mask costs £12.99 online and has black eye nets to see through.